Inglewood Open Studios Celebrates Its 11th Year! LOS ANGELES, CA – Inglewood has become the fastest growing artist community in Los Angeles. It is also the fastest growing city with the upcoming NFL stadium, Hollywood Park Casino and Hollywood Park development, two new Metro stations, new art galleries and new businesses moving into Inglewood. The 11th annual Inglewood Open Studios will showcase individual professional artist studios and art galleries that make up the burgeoning Inglewood art community. On both Saturday November 11 and Sunday, November 12, 2017, Inglewood Open Studios artists will open their doors to the public, inviting visitors to personally tour their private working spaces and enjoy art created in all media--drawing, painting, sculpture, mixed-media, photography, print making, installation, video and performance. This marks the first year that Inglewood art galleries will also participate as stops on the tour. 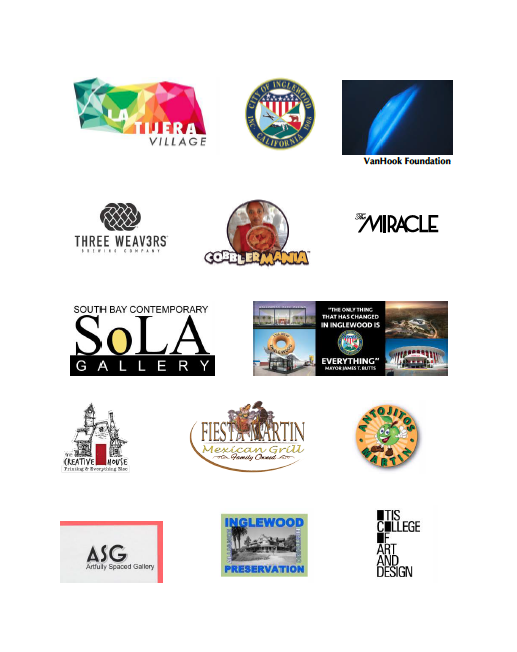 2017 Inglewood Open Studios is organized by founder Renée Fox and Inglewood artists Holly Tempo and Anne Cheek La Rose, with the additional support from local sponsors (listed below) and fiscal receivership provided by the Inglewood Historic Preservation Alliance, a 501(c)(3). An official map with Inglewood Open Studios participating art studios and art galleries will be available online, at all locations on the tour and at sponsor locations. For additional information on Inglewood Open Studios, including the printable tour map, please visit www.inglewoodopenstudios.com. Free shuttle transportation will be provided by our generous long-time sponsor, the City of Inglewood. Adrienne Adar, Susan Amorde, Debe Arlook, Branch Gallery, Brian Biedul, Martin Bruinsma, Darel Carey, Michael Cormier, Creative House, Bibi Davidson, Beth Dubber, Martin Durazo, Exceptional Children’s Foundation (ECF), Renée A Fox, Lee Jordan, Rachel Kaster, Heidi Kidon, Thomas Kratz, Anne Cheek La Rose, Michael Massenburg, Gale Mccall, Bridgitte Montgomery, David Newcombe, Melanie Newcombe, Lindsey Nobel, Kenneth Ober, Snezana Saraswati Petrovic, Minna Philips, Nicole Rademacher, Calida Garcia Rawles, Lucas Reiner, Toni Reinis, Residency Gallery, Joan Robey, Dawn Rosenquist, Daniel Rothman, Deborah Salt, Stan Smith, Ernest Steiner, Holly Tempo, Sidney Tuggerson Jr., Ginger Van Hook, Luke Van Hook, Sandra Vista, Keith Walsh, Tori White, Rana Wilson. Inglewood is nestled in the center of Los Angeles County. Bordered by the LAX International Airport on the south, the City is in close proximity to Otis College of Art and Design and is surrounded by the cities of Culver City, El Segundo, Marina Del Rey, Westchester, and Torrance. VHF is a 501(c)(3) non-profit organization founded in Inglewood. The Van Hook Foundation’s mission is to promote the merging of fine art and science through the curation and installation of artistic, educational and scientific exhibitions for the public and to promote visibility of local arts communities in Los Angeles and surrounding areas. The 2017 Inglewood Open Studios organizers and participants would like to thank our generous Sponsors: Antojitos Martin, Artfully Spaced Gallery, City of Inglewood, Mayor James T. Butts, Jr., District 2 Councilman Alex Padilla, The Creative House, Cobbler Mania, Fiesta Martin, Inglewood Historic Preservation Alliance, La Tijera Village, The Miracle Theater, Kali Nikitas, Inglewood Arts Commissioner at Large and Rich Shelton, OTIS College of Art and Design, Three Weavers Brewing Company, SoLa Gallery, and the Van Hook Foundation.